Woo, woo, Chattanooga, there you are!" Yep, it was back to Tennessee for Three Friends this week. We were heading to the 4th largest city in in the state, home of the famous Choo Choo and, as we've mentioned in previous posts, Moon Pies, or piiiiies as Sherri and Luanne would say (you have to draw that i waaaay out)! As a point of interest, Chattanooga is also unique in that it is the only American city to have its own typeface, Chatype. 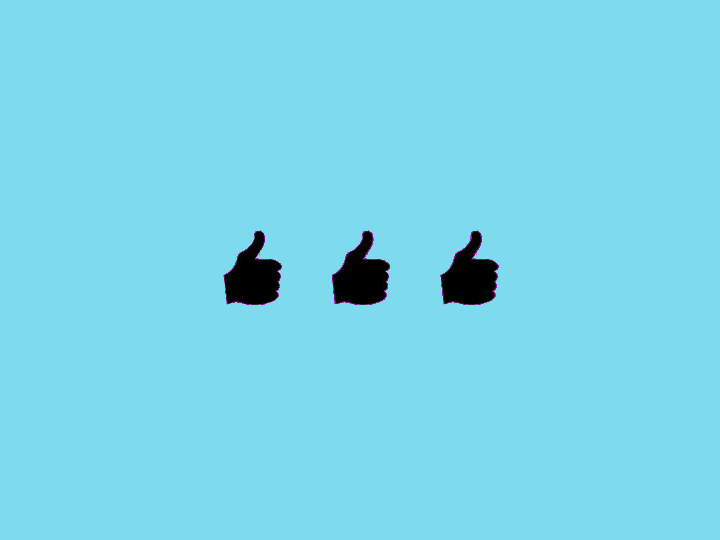 I really wish we could have posted this blog in the Chatype font! Chattanooga has several nicknames: Scenic City, River City and Gig City; the last because it boasts that it has the fastest internet service in the Western Hemisphere! That's quite a boast! Additional Chattanooga points of interest include The Chattanooga Zoo, Ruby Falls, Rock City and The Creative Discovery Museum. Because Chattanooga is surrounded on three sides by mountains and sliced in two by the Tennessee River, it is an outdoor lover's dream. Not only can you hike up Lookout Mountain, you can cruise through a river gorge on a hydrofoil-assisted catamaran, take an overnight trip on a refurbished 1920's steamboat and, yes, hitch a ride on the Southern Belle, a true riverboat queen. We know you are channeling Tina Turner right now! Chattanooga has plenty of restaurants, cafes and food stands for foodies and hungry people alike. So much so, that The Friends had a hard time deciding where to go! We received so many good suggestions for places to visit that we know for sure we will be jumping on the Chattanooga Choo Choo again sometime! So, where did we go? Our choices were many...bbq and ribs at Sugars, home cooking at Bea's, high tea at the English Rose, gyros at Ankar's Hoagies, pastries and paninis at Rembrants... Lands! It would just about make your head spin! So after all that spinning and much discussion, we narrowed our choices to two Mexican restaurants. Why? Well, The Friends looooove Mexican food and both choices sounded wonderful. One was called Taco Mamacita's and it looked and sounded like our kind of place. 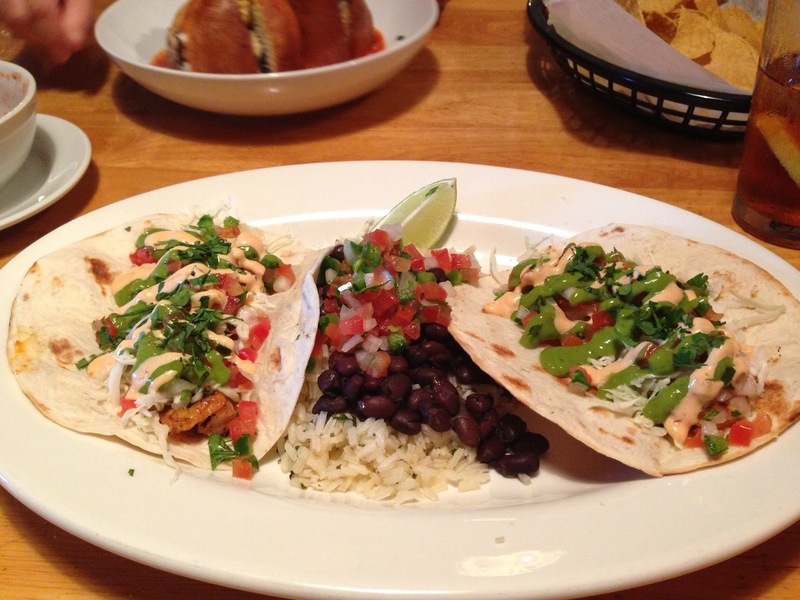 We checked out Taco Mamacita's website. The restaurant looked fun and had lots of different kinds of entrees on the menu...shrimp po'boy taco, anyone? We were almost hooked and actually we would have gone there except for one last minute suggestion. The very last suggestion we got was from Billie Chaney and she said, "Ovalle's on Broad Street, a friend's suggestion". So, we visited Ovalle's website and it was really intriguing. It was less fiesta and more old world, much more subdued. In other words, totally unlike any Mexican restaurant we have ever seen. The website also highlighted a large wood burning oven. And the entrees? Wow! Totally different! Yes, they had tacos and quesadillas, but the ingredients were unusual...chipotle mayo, sliced radish and pickled red onions. Honestly, we were curious! So, Ovalle's it was and boy, oh, boy, were we happy with our choice! Thanks, Billie! According to Ovalle's website, the recipes are inspired by traditional Mexican street food. At first look, the menu differs from most Mexican restaurant menus by, much like the outside of the building, being restrained. It is very small, not as many items, in comparison to most. We received a regular menu and a special, daily menu. On the regular menu, we found Antojitos (Marien says those are little cravings), Soups, Salads, Platos (plates), Tortas (big sandwiches on crusty French bread), Beverages and Desserts. And just a few items in each category. By the way, if you crave a margarita or beer with your chips and salsa, you are not going to get it at Ovalle's. The only beverages on the menu were Aguas Frescas (fresh fruit flavored waters), fountain drinks, coffee and chocolate. The special menu included, three taco platters, traditional mini street tacos, a grilled quesadilla and Pollo a la Crema (chicken in a creamy sauce with roasted poblano and smashed potato with Spanish cheese). We spoke with one of the owners about the interesting ingredients and she told us everything is made in house, they use the freshest ingredients they can buy and ground beef will never be found in Ovalle's recipes! Preparing the Guacamole en Molecajete and withholding an ingredient! 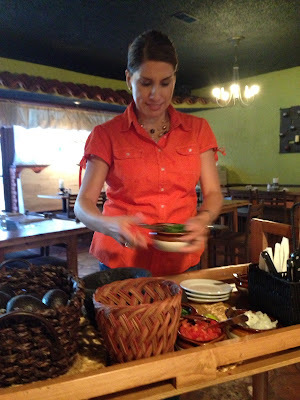 We knew right away we were going to have the guacamole en molcajete prepared right at our table, so we went ahead and put in an order for that when our drink order was taken. 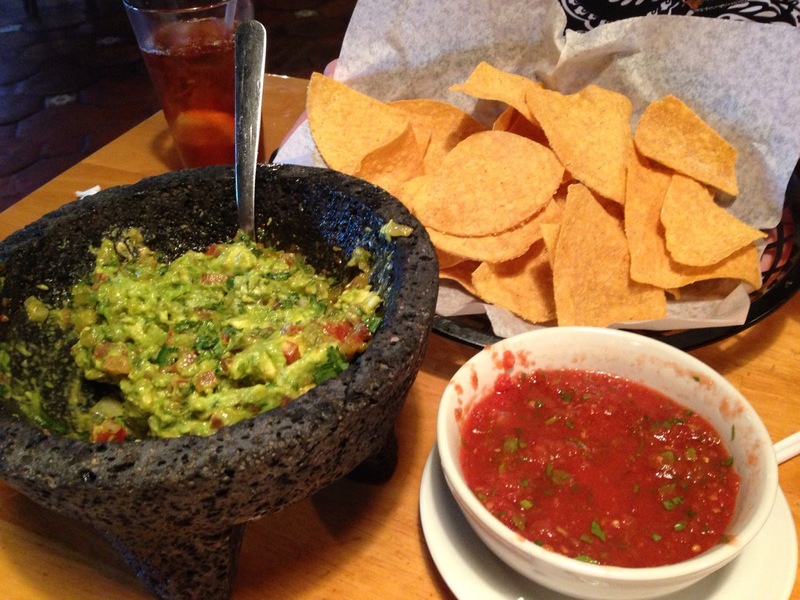 When our waitress asked how we liked our guacamole, we said, "Spicy!" She gave us a wide-eyed look and dumped in some extra jalapenos! Luanne asked her to explain what she was doing as she added ingredients and she said, "avocado, tomato, red onion, garlic, chipotle, cilantro, lime, and," much to our frustration, "a secret ingredient" with a smirk on her face! It was all we could do to keep from snatching that bowl out of her hand to inspect! While we munched on the wonderfully fresh guacamole and some equally amazing salsa, we studied the menus some more. True to form, I was leaning toward the fish taco, but also true to form, I wondered if I might substitute grilled shrimp for the fish. The waitress was very accommodating, as she should have been since she was withholding guacamole ingredient information, and she said they would be able to do that. Yay! Luanne, was eyeing the grilled quesadilla which was described as braised chicken, Chihuahua cheese, roasted vegetables and chipotle mayo. Now, if you've been following Three Friends and a Fork, you know about Luanne's aversion to mayo. So, you know the first thing she was going to do was ask if she could get that quesadilla without mayo. Again, the answer was, "yes!" The Friends are nothing if not predictable! Thankfully, Parker, decided to get a torta. According to Wikipedia, in Mexico, a torta is "a kind of sandwich served on an oblong 15 cm firm, crusty white sandwich roll, called a bollilo, telera, birote, or pan francés, depending on the region. Tortas are typically eaten cold, but can be served hot, grilled or toasted in a press in the same manner as a Cuban sandwich or panini." The torta at Ovalle's was toasted in the wood burning oven. And, I said Sherri "thankfully" ordered the torta, because, if someone had not ordered a torta, I was going to have to change my order. I just thought one of us needed to try one of those tortas! Sherri chose the Ahogada. More about that in a minute. Here is what our entrees looked like. Lu's Grilled Quesadilla...Chipotle Mayo on the Side! Luanne's quesadilla came with the chipotle mayo on the side. I guess the chef could not imagine leaving it off altogether! Sherri and I quickly grabbed it and dipped our chips in it. Amazing! I could bottle that stuff and drink it! We tried to get Luanne to try it, but she was having no part of that. I continue to think if we keep encouraging her, one day she will overcome her aversion. I have to say, though, I feel the same way about liver. I have this recurring dream where that little chairman on the Iron Chef comes to me and says, "I need some complete nobodies with untrained palates to judge our next Iron Chef competition. Will you do it?" And then my dream quickly turns into a nightmare when Sherri, Luanne and I are sitting on the judges panel and the Chairman announces the secret ingredient: Liver! Ugh! I don't think there is an Iron Chef on the planet who could make liver palatable to me! Anyway, I digress. 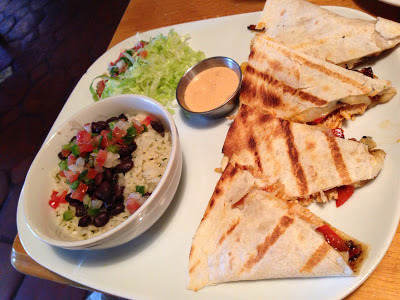 Luanne's quesadilla was really good, even without the chipotle mayo, spicy, crunchy, and smoky. We all loved it. It came with a bowl of rice and black beans topped with fresh pico de gallo. My grilled shrimp tacos were topped with avocado, cabbage, carrot and (yes!) chipotle mayo. They were beautiful and tasted just as good as they looked. I also got the cilantro lime rice with black beans and pico de gallo. Most notable? There was not one sliver of cheese on my plate. You know how some Mexican dishes are so covered in cheese that you can taste nothing else? Well, that was not the case here. You could taste all the fresh flavors. Not one dominated the others. Sherri's entree, however, won the prize. 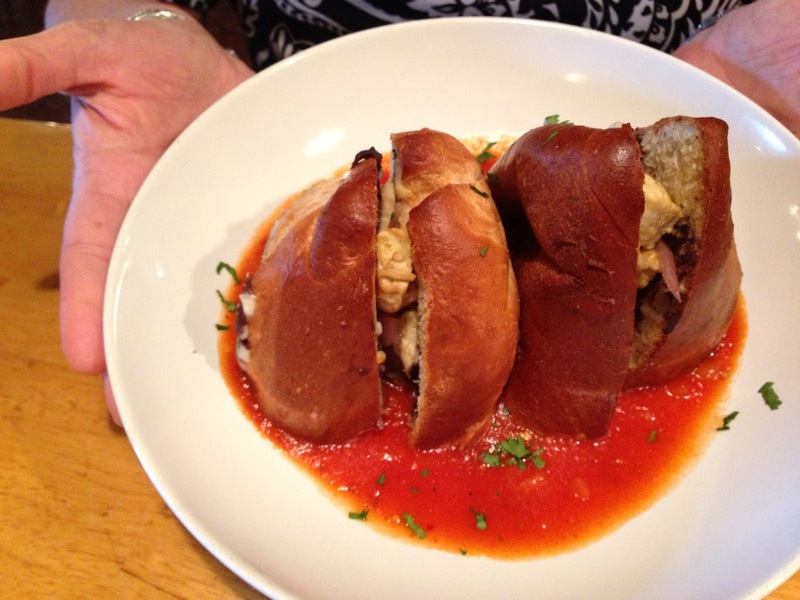 Her torta was huge, cut in half and plunged, cut side down, into a rich thick, tomato broth. It was filled with smoky chicken carnitas, black beans, Oaxaca cheese, chile de Arbol and pickled red onion. The tomato broth was spicy (from chile de Arbol) and tomatoey (from tomatoes! ), a perfect pool for dipping the crusty filled bread. We had never had anything like it. We passed on desserts, because we had other ideas, but the picture of the cheese flan with caramel sauce and Guayaba ice cream and the almond cake will definitely bear further inspection. 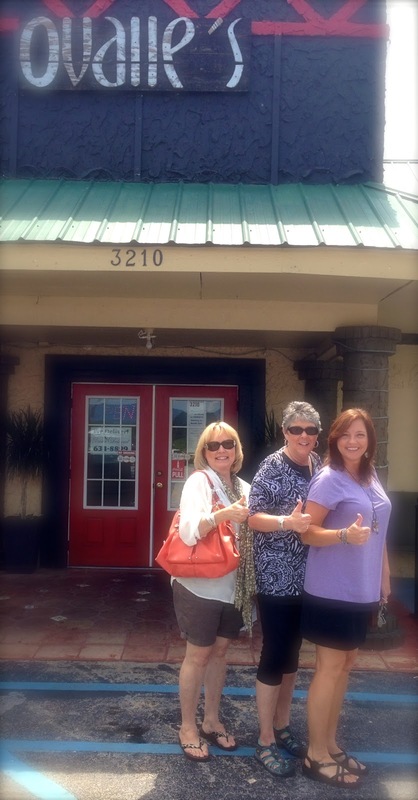 Three Friends highly recommends Ovalle's for those of you who want to try a different spin on Mexican food. The flavors were so fresh and clean. We loved it and absolutely give Ovalle's 3 Yums UP! Three Friends give Ovalle's Three Yums UP! Ole! Now, as for the rest of our trip, that story will have to wait. There is too much more to tell! We made a few more stops before returning to Alabama. Until next time, say it riiiiight... Byyyyye, byyyyye! I couldn't agree more with your assesment! My husband and I literally stumbled upon this place when last in Chat-town. We were SO IMPRESSED with their menu, and even more so once our choices arrived. We'll return every time we visit the city!! You are both correct. Ovalle's is Chattanooga's best kept secret, but not for long. With food like that, folks are going to be lining up. Thanks so much for stopping by!